Pizza | Pasta Takeaway Delivery for Puerto del Carmen, Puerto Calero, Macher , Tias. Open daily 11:00 - 22:00 . Great selection of food to Takeaway in Puerto del Carmen from pasta, tapas to great pizzas, freshly made. Good menu choice and very generous portions. Open Daily from 11:00am to 22:00pm . 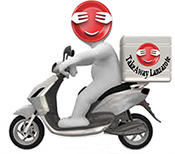 Takeaway Lanzarote - Restaurants Puerto del Carmen Pizza Hawai : Ham & PinneaplePizza Takeaway Puerto del Carmen Lanzarote, Pizza Restaurants takeaways , pizza food delivery Puerto Carmen - Best Pizza Restaurants Lanzarote with Delivery Takeout Canarias Las Palmas. Takeaway Lanzarote - Restaurants Puerto del Carmen Mix Salad : Red and Green Peppers, lettuce, corn, tuna, onion, egg, fried bread. Italian Takeaway Lanzarote, Italian Restaurants takeaways , italian food delivery Puerto del Carmen - Best Italian Restaurants Lanzarote with Delivery Takeout Canarias Las Palmas.